More than half of Americans are struggling to hit their retirement goals, according to a new report from Investopedia. Specifically, 52 percent of surveyed U.S. workers said that they feel behind on their target savings, and 60 percent of respondents ages 50 and older indicated that they are worried about having to delay their retirement. Similarly, Capital One’s annual Financial Freedom survey revealed that less than two-thirds (62 percent) of Americans feel confident that they are saving enough to achieve a comfortable retirement, down from 72 percent in the 2015 survey. 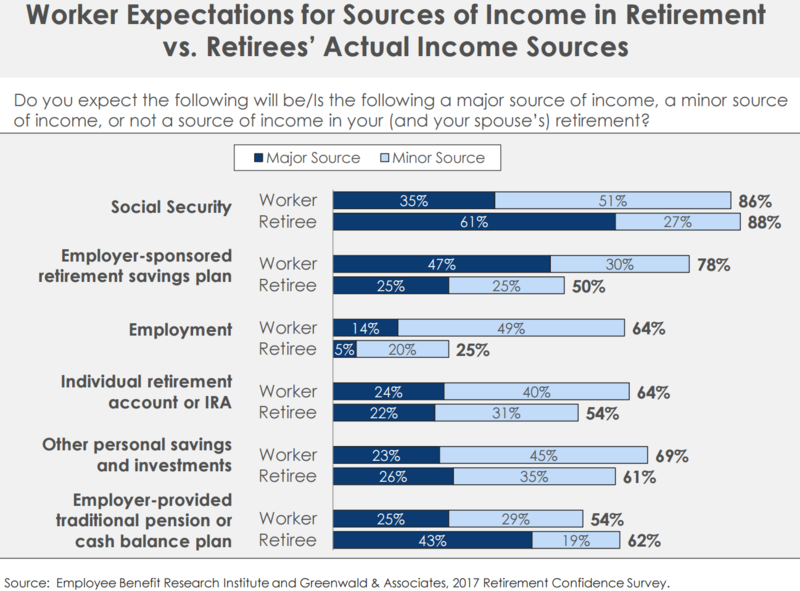 Such doubts are not too surprising since only 65 percent of surveyed non-retired adults said that they are regularly putting away some portion of their income for retirement, of which only 13 percent reported that they are contributing 15 percent or more of their earnings to a savings plan each year. As for those individuals who are saving and investing, it seems unlikely that recent stock market performance is weighing on their retirement confidence because the S&P 500 jumped by 5.5 percent during the first three months of 2017. That was the sixth quarterly gain in a row for the benchmark index, and the largest quarter-over-quarter increase since 2015. Participants in tax-advantaged 401(k) plans fared even better in Q1, according to new data from the Employee Benefit Research Institute (EBRI). Specifically, the average 401(k) account balance for younger (25-34), less tenured (1-4 years) workers surged by 13.4 percent last quarter, with most of the gains occurring in February when the S&P 500 rose 3.7 percent. Older workers (55-64) with more than 20 years of tenure saw their 401(k) balances rise by an average of “only” 6.4 percent in Q1, not surprising since these individuals tend to have much larger accounts that are less sensitive to both contribution size and market fluctuations. Despite the strong investment gains, saving for retirement may still seem daunting for many Americans simply due to how much money they anticipate needing in order to fund their desired standard of living in old age. 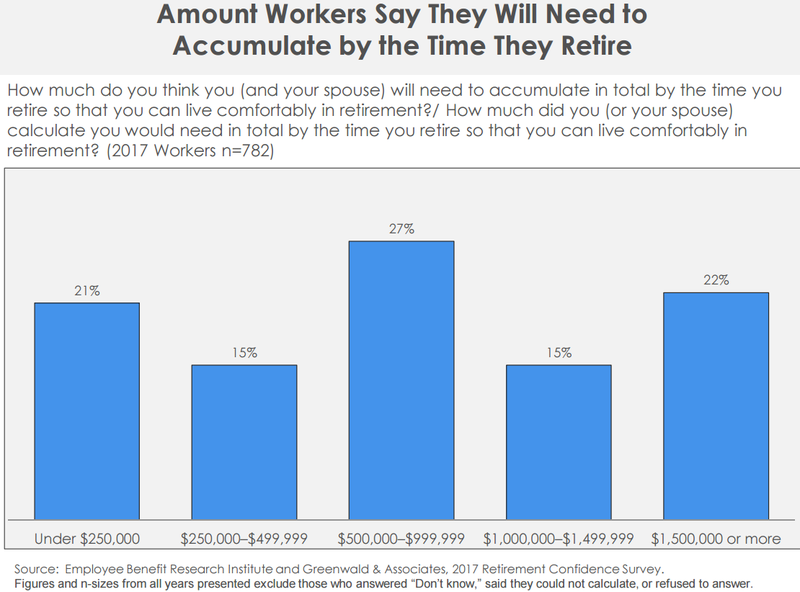 For example, another recent EBRI study asked a large number of working adults “how much do you think you (and your spouse) will need to accumulate in total by the time you retire so that you can live comfortably in retirement.” Nearly two-thirds (64 percent) of respondents said that they expect to need at least $500,000 in savings in order to achieve their desired retirement outcome, and more than a third (37 percent) anticipate that they will have to set aside at least $1 million prior to retirement. Hitting such savings targets is becoming more important than ever due to the growing role of retirement self-funding. Indeed, defined benefit pension plans are less common, and the long-term financial sustainability of Social Security has been increasingly brought into question as older individuals account for a rising share of the population. The latter is a risk that could lessen over time if the economic expansion in America picks up markedly and is accompanied by an upturn in the fertility rate, i.e. more young people working and paying (taxes) into the system. However, it is probably not a good idea to leave one’s financial future up to chance, and many financial professionals already recommend that people plan for Social Security payments to account for a relatively small portion of their retirement income. Working Americans in the EBRI study seem to share such concerns because only 37 percent of surveyed pre-retirees said that they are very or somewhat confident that Social Security will “continue to provide benefits of at least equal value to the benefits received by retirees today.” Further, a majority (51 percent) of worker respondents said that they expect Social Security to be only a minor source of their income in retirement, compared to 27 percent for current retirees.